Welcome, friends, to our latest fundraiser for our Cameroon DNA project! Despite the long delay since you've heard from us, there is nothing but good news. First to fill you in on what we've been up to: we've both just been busy with the necessities of earning a living in this world, but our commitment to this project continues. Matthew, having been awarded his Ph.D. last year, now has a teaching position at the U. of Buea, Cameroon's flagship English-language university, as well as a part-time Registrar appointment at a technical college. Bonnie's genetic genealogy data visualization startup, DNA RootSearch, with the guidance of a highly experienced small-business mentor and a brilliant new team member, will be upgrading its product to online, interactive graphs for all customers in the coming months. Our A00 research project's 900 samples are now all safely stored at YSEQ, with Thomas and Astrid Krahn in Berlin. These were collected by Matthew from villages from a wide swath across Cameroon, from the far Southwest to Southeast (the North is a separate region that we don't think is critical to the story of A00, and is perilous for travel because of the incursions of Islamists from Nigeria). Matthew has also re-visited most of the villages to return the results of our testing to the participants, something that we don't think has ever been done by a population genetics study on this scale before. There's just one more of these trips left to do, and that's why we're asking for your support right now. 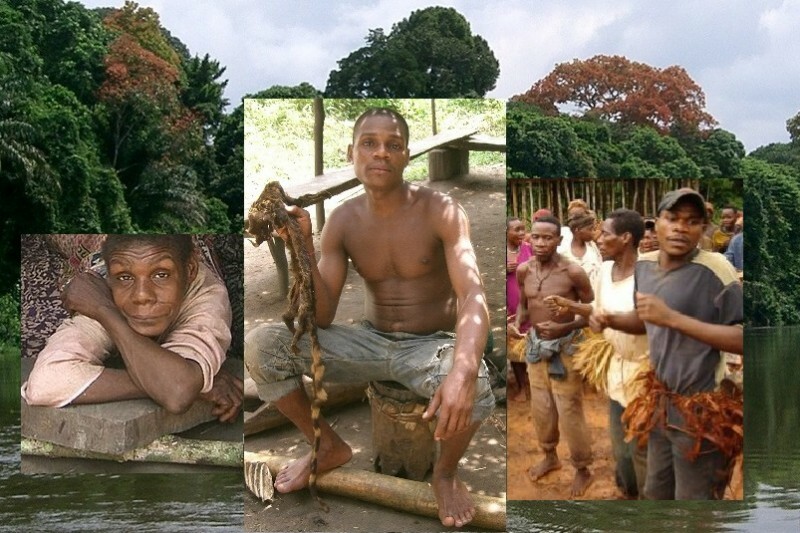 He has a limited time window available this summer before classes resume, and he wants to travel to the southern forests again, to the settlements of the indigenous Baka and Bakola peoples, to share what we've found with them. The expenses for this trip to a series of villages in the back country, plus a small donation for some of the Baka people, amount to $1200. Though there are about thirty samples that YSEQ hasn't gotten around to testing yet, which could always hold surprises, the big picture of what we've found seems clear. A00 is found at substantial frequencies only in a small area of Cameroon along the northeast side of the Southwest Region. Even more important, its diversity is very limited, despite the enormous time since its divergence from the other Y-haplogroups. I was at first disappointed with these results, until I came to realize their implications. The limited genetic variance found in the SNPs and STRs of A00 members, most likely indicates that it has had relatively little time to diversify since becoming established among modern human communities. If this lineage had been present among us since its inception over 250,000 years ago, it would by now have mutated to form untold numbers of branches. Even repeated wars of conquest and population replacements would be unlikely to entirely eliminate all but one small clade out of the hundreds that should have existed. The alternative is what has already been suggested by a series of papers on autosomal DNA by leading geneticists: it may have been introduced from an archaic-human hybridization event in relatively recent (though ancient) times. We intend to do extremely careful sequencing and dating estimates of the differences that do exist between our A00 samples, to offer the best hypothesis we can regarding the date in the past at which the currently extant lineages converge. There is more lab work to be done, too, but for now, we'll just ask you for enough donations to get Matthew on the road back to the forest people. We need to test SNPs in a number of A00 samples that have so far been identified only by STRs, and if we're lucky, maybe get another full sequence done. Once we have a clearer picture of what we'd like to do, we'll update you and have a new goal. You, the community, are allowing real science to be done outside of institutions, on a people-to-people basis! We hope you'll be excited to be a part of this ongoing adventure to uncover the unexpected story of the ancient past in today's DNA. Hi everyone, we're back! With Spring 2018, we're seeking enough funding to bring our research to a successful conclusion. We've collected 95 A00 samples from ethnically diverse Cameroonian villages! Now we need to do more in-depth testing to learn more about them. We also need to reimburse Matthew for the amount he had to contribute to his last field trip, because of the shortfall in last year's donations. Conditions are tough in Cameroon now, especially for the English-speaking population -- I'm sure everyone will want to give him a decent level of support in appreciation for all he's done. We'll be testing SNPs at YSEQ in more of the A00 samples, some already having been studied in detail, but others remain to be investigated. Maybe we'll even be able to sequence another sample or two, in addition to the three we already have. Sequencing is now becoming the standard in genomic science, so we don't want to become irrelevant to the fast-advancing world of population genetics. Whatever is decided, having at least those three sequences will be crucial. Let's show what Citizen Science can do! I'll be updating our goal soon, as the amount shown was from our previous campaign. Thanks! Yay, our first donation! Thanks to Catherine Kesseler! Bonnie Schrack and I - including our lab technicians - have put in much energy and time in the A00 Cameroon Research Project and now we intend to finalize when to start analyzing the geographic distribution of Haplogoup A00 in Cameroon, a country with striking ecological, linguistics, ethnic, cultural, religious and other diversities. Unfortunately we cannot start the analysis without returning the DNA results of our donors, especially the Baka and Bakola who were very collaborative during our samples collection trips in the Littoral, South and East of Cameroon. As usual, we would appreciate whatever contribution comes in from our supporters. would you be able to process and test Ancestry DNA results? or do we have to buy your kit to do this?